There was nothing special about the J-Bar ranch in Colorado…except that it has thirty-five thousand acres of prime land and its previous owner had just been murdered leaving $50,000 and hidden gold. Logan Winters has created some extremely well drawn characters in this very fast moving story, most of whom are fuelled by greed, deserting their jobs to join the frantic search for the missing money. Then there’s the hero of the tale, Glen Strange, who, along with his partner, find themselves swept up in the crazy situation they ride unwittingly into. Are they the only people who find it strange everyone is hunting for the gold without the least bit of concern over who killed J. Pierce Buchanan, and why? This isn’t the only mysterious element to the story for Strange is soon wondering what secrets others are hiding, such as their relationships with the now grown girl who was found abandoned on the ranch when a baby. And who is the man who introduces himself as Wichita? Of course in a tale such as this not everyone can have a happy ending and a number of them die violently in well-described gunfights. One of these shootouts being particularly memorable due to it taking place in a pitch-black barn where no one can actually see their opponents. Yes, for some, the ending was exactly as I suspected it would be, although I didn’t even come close as to where the hidden fortune was hidden, like I didn’t g uess the answers to most of the questions the plot challenged the reader with. As with the other books I’ve read by this author (Logan Winters being a pseudonym of Paul Lederer), The Legacy once more proves he’s a writer who produces entertaining books time after time. 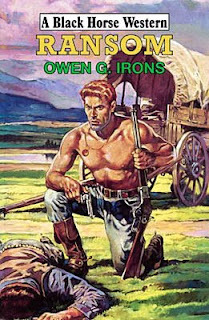 The Legacy isn’t the only BHW officially published this month, on May 31st to be exact, by Paul Lederer, as he has another released under the pseudonym of Owen G. Irons called Ransom. Both these books are available now. It was with a near-broken heart and a deep hatred that Jim McKendry looked down at his father lying dead in his coffin. He could barely look at the lifeless face and the silk wrapping that covered the ghastly wound across his father’s throat. Jim swore that someone would pay for his father’s death and no matter what it took the killer would be brought to justice – alive or dead. 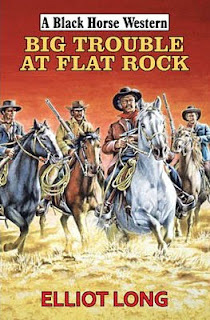 With over thirty Black Horse Westerns to his name, Elliot Long has become a favourite with many readers, so it may come as a surprise when I tell you, that even though a number of his books can be found in my collection, this is the first story of his I’ve read. Elliot Long knows how to pace a story, how to create memorable characters, and how to spring surprises on the reader. All his story threads race towards a brutal and well-written final showdown that ties everything up neatly. The story shows how a man can be driven by the lust for revenge, so much so everything else in his life is pushed aside, including his woman and his family. For me, though, Jim McKendry isn’t the most fascinating character in this story, that honour falls to the hired assassin, van Otis, a man with ties to the Tongs. At first I was disappointed Elliot Long let on who had hired van Otis but this lead to a neat twist in having this person kil led off soon after, rubbed out by van Otis, and this time the identity of the hirer is kept a secret. The author gives a few hints as to who this person is, but too many characters fit with these clues, thus ensuring the reader continues to keep turning the pages. Looks like it won’t be long before I’m hunting through my collection for more of Elliot Long’s books. Big Trouble at Flat Rock is available to order now from all the usual Internet sources even though it has an official release date of May 31st. The dead town of the title only plays a small part in this fast moving book, and has some very memorable scenes involving missing bacon. Once this mystery has been solved Adams finds himself helping out a woman – in fact he helps more than one woman in different ways as the tale progresses. The st ory soon becomes a chase tale. The hunt sees Adams riding through various towns and meeting a variety of lawmen along the way. One of these has stuck in my mind, not least because he rides alongside Adams for much of the book, and sides him in the final gunfight, but for his name. J.R. Roberts (Robert J. Randisi) must have had fun creating this character, for this lawman has another job too, that of the undertaker, and his name is Deadly. 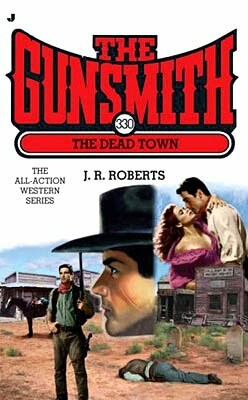 This book, like the majority of The Gunsmith books I’ve read, soon sweeps you up in the story with is easy style and dialogue driven prose, which once again proves why this series is so popular. Gunned down and left for dead, Ben McCabe is nursed back to health only to learn that he is wanted for murder and robbery. He has no memory of his past but he sets out in search of the truth, gradually putting together the events that led to his shooting. As his memory slowly returns, he tracks down the real killers – but his problems are by no means over. After enjoying Peter Wilson’s previous two Black Horse Westerns I was eager to read this one hoping it would match the excellence of those earlier books. Peter Wilson tells his story in short series’ of paragraphs that follow the movements of the various well-crafted characters. This method working well to hook the reader and keep them turning the pages to find out what fate awaits each of them. There are a number of different threads such as will McCabe be able to save his sister from her wife beating husband and which of the two women who fall for McCabe will he end up with, his choice perhaps ending in a surprise for some readers. There’s plenty of action too, murder and shoot-outs, mixed in with double-crosses, come at regular intervals as the b ook moves forwards at a tremendous pace. And just for good measure Peter Wilson throws in a twist or two to keep the reader guessing, thus ensuring the book isn’t put down before the end is reached. As you’ve probably already gathered I did enjoy this story as much as Peter Wilson’s other books and once more I’m looking forward to his next. 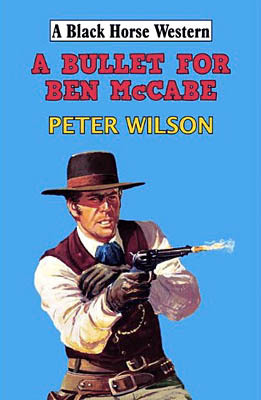 A Bullet for Ben McCabe is officially released on May 31st but is available now from the usual Internet booksellers. Randall Foster was a young schoolteacher who got dragged into a deadly clash of clans. When the dust settled, the teacher was hand picked by a covert government agency called The Service. 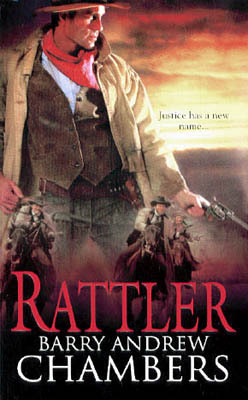 Proving himself in a secret training program, Randall Foster soon has a new career, a code name “Rattler”, and a stubborn horse that does everything except obey. The cover, the blurb, both indicate that this is an action packed read, even a quote on the back says the book is “loaded with action”. How wrong these can be… However that doesn’t mean it’s a bad story, just not quite what I expected. Barry Andrew Chambers has written a very readable story, filled with people that you’ll warm to, probably due to his well-portrayed characterizations. The story is filled with beautifully observed studies of human nature, often told with gentle humour, such as how the mind says one thing but the mouth speaks another. More than being filled with action most of this book is about Foster falling in love. Lots of the story being taken up with him and Benita visiting the opera, county fairs and taking part in baking competitions. There is some action, and the whole book leads up to a dramatic shootout that doesn’t have the ending for some as you’d expect. Shame the tracking down of the killer takes up such little space within the story. Chambers also includes quite a bit of, for me anyway, over-the-top humour, which I think would have been more at home if the whole book was a comedy. Most of this revolves around Foster’s horse, some of the antics it gets up to stretching my belief somewhat; such as it being able to pick up a heavy saddle in its teeth, toss it up in the air, over it’s head, so it flips and lands on its back in the correct position. Still, as I’ve already said, the book is an easy read, and if started you’ll want to read to the end to find out what happens to the characters. The latest issue of Black Horse Extra is now available. There's some great articles including David Whitehead discussing how to increase interest in the western and another article that looks at back cover blurbs. There's also the second part of Greg Mitchell's look at the artwork of Frederic Remington. Hoofprints, as usual, offers some fascinating observations. 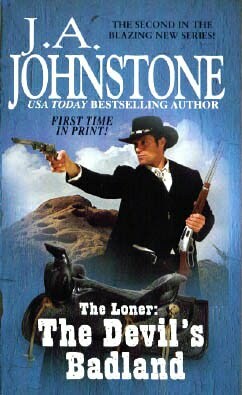 Whilst on the subject of Black Horse Westerns, Hale will be releasing books by a couple of well known American western writers latter this year, namely in September 2010 comes Wade's War by Chet Cunningham, and Twin Rivers by John Nesbitt (a new publication of an old story) in October or November 2010. August 2010 sees Bonito Deputy as by Jack Slade - I wonder who is behind this name? Finally, for those who enjoy western films, it looks like another John Wayne western is to be remade. It seems Warner Brothers are planning to remake The Cowboys. The original hit the screens in 1972 and came from the book by William Dale Jennings. Banker Amos Fillmore’s life is shattered by the brazen kidnapping of his pretty daughter, Anita. The kidnappers, led by the notorious gunman Earl Weathers, demand a ransom payment that can only be raised if Fillmore raids the assets of his Crater, Arizona bank. In the end, even that payment is not enough. Duplicity and violence rage while Anita remains hostage in a cave carved deep into the hills of the desert wilderness. Her safety is secondary to avarice, and even those tasked with upholding justice are inept and overcome with greed. It seems as though neither Anita nor her ransom will ever be recovered from the grip of the desert. That is until the territory’s top gun, Laredo, steps in…. This book starts after the kidnapping has taken place as Amos Fillmore helps himself to some of the banks money and the story never lets slows down after the opening scenes throw all kinds of questions at the reader. There are many well-drawn characters, none of who seem to trust each other, and indeed many are planning to double-cross each other. All these twists and turns making this book very difficult to put down before everything is resolved. The act ion is well described as are descriptions of people and location. The pace of the tale moves from a trot to a canter to a gallop swiftly, grippingly, before the final dramatic shootout. But then I’d expect all this from Owen G. Irons (a pseudonym for author Paul Lederer) as I’ve yet to read a BHW from him I’ve not enjoyed. Ransom has an official release date of May 31st but should be available now from the usual Internet sources. 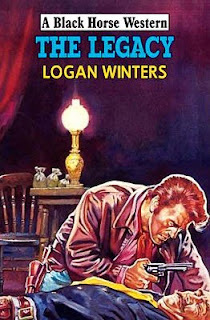 Fans of Paul Lederer’s work will also be pleased to know this isn’t the only BHW of his out this month as The Legacy, as by Logan Winters, is out now too. After Conrad Browning, known as The Loner, takes down the men who killed his beloved wife, he hightails it to New Mexico to visit her grave. There, he gets the surprise of his life: His ex-fiancée, Pamela Tarleton, backed up by a vicious gang of gunmen. Turns out the beautiful Miss Tarleton has a long memory – and she’s never forgiven Conrad for breaking off their engagement and marrying another. On top of that, she blames Conrad for her father’s death. With a band of kill-crazy outlaws backing Pamela’s play, the only way out for The Loner to survive the coming hell storm is by the gun. I’d imagine the above blurb, taken from the back of the book, is the kind that makes an author grit their teeth in annoyance as it reveals too much of the plot. The author goes to great pains to conceal the identity of the person behind the evil that Conrad Browning has to battle only to have it given away on the back of the book. This story follows on closely from the first Loner book. The author keeps the reader hooked with the question of who is behind the outlaws who killed Browning’s wife in the first tale, and adds to that mystery the question of why are they intent on turning Browning’s life to misery. Of course this is all explained during the telling o f the tale but more detail behind these reasons can be found in William W. Johnstone’s thirteenth Last Gunfighter book, Savage Country (which makes one wonder if both books were written by the same author). Good to see that this series is now being sold by booksellers other than just Walmart, thus making the books much easier to find, particularly if you’re outside of America. Going by the strength of the first two books this series should be on the reading list of all western fans who enjoy well written, fast paced, action packed books that prove to be hard to put down once started. Skye Fargo knows Nez Perce Indians well enough to respect them. So when a wealthy rancher aims to breed the tribe’s legendary Appaloosa horses, he hires Fargo to act as go-between. But even the sweetest deals can go sour when money is involved, and now the Trailsman is either going to cash in big or cash out permanently. The majority of this story sees Skye Fargo spending most of his time with Indians. Living with them, fighting alongside them, fighting them, and being held captive by them. There is mistrust to deal with and friendships to rekindle. 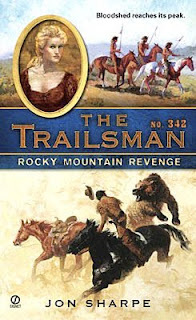 As to be expected from a Trailsman book the story moves at a tremendous pace, is filled with exciting action as Fargo battles with both humans and other creatures. Of course being an adult western series there is also a couple of hot encounters for the Trailsman too, one being of the kind I can’t remember reading in a Trailsman book for a long time, if at all. Author Jon Sharpe (in this case David Robbins) keeps the reader glued to the pages through a strong mystery plotline centring around three half-breeds who want to stop the purchase of the Appaloosas. Why? The answer to this question only being explained when the author is ready reveal all, a reason I didn’t see coming. An answer that exposes some of the worst traits of the human race and leads to a powerful, and sad ending, for many of the superbly drawn characters that sees Fargo going on a bloody killing spree. Another strong tale that, for me, highlights the reasons I keep buying the Trailsman books each month.